And then when you play him he shouts "MRGL FORWARD!" I hope they un-nerf it and release it to the wild at the beginning of the year. For the love of god this card needs a nerf. I'm so sick of Murlocs! EDIT: THANK YOU BEN BRODE! FINALLY! 0.66 % in mage decks?? Am i missing something :D? For the longest time, I thought that was a rain storm cloud over the murloc's head. The murloc design is amazing! I wonder how long it will stay in the standard format. 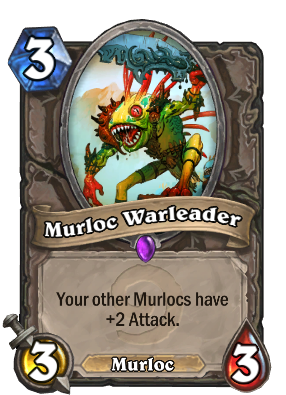 Lately all Murloc decks were build around some sort of bluegill/warleader strategy. I'm curious whether they will want people to try something different in the future. With two of these on the board they will survive Equality and Wild Pyromancer combo. At first I thought that the upper part of the art was some leaves and that spikes were branches. I couldn`t understand *what`s wrong with all that tree thing oh his back*. Then I realised - it was his weapon.